Combine sugar paprika, 1 tablespoon salt, 2 tablespoons pepper, and white pepper bowl. Pat pork dry with paper towels and rub spice mixture all over pork. (Pork can be refrigerated, covered with plastic wrap, for up to 24 hours). Using large piece of heavy duty aluminum foil, wrap 2 cups soaked chips into foil packet and cut several vent holes in top. Repeat with remaining chips. FOR A CHARCOAL GRILL: open bottom vent halfway. Place q foil packet on 1 side of grill, cover with 3 quarts charcoal briquettes (half of large chimney starter), and place second foil packet on top. Light large chimney starter there quarters full with charcoal briquettes(4 ½ quarts). When top coals are partial covered with ash, pile on top of second foil packet. Set cooking grate in place, cover, and open lid vent halfway. Heat grill until hot, about 5 minutes. Clean and oil cooking grate. Place pork on cool side of grill and cook, covered, until pork is lightly charred and smoky, about 4 hours. Adjust oven rack to middle position and heat oven to 325 degrees, transfer smoked pork to roasting pan and cover pan tightly with foil. Bake until pork is tender and pulls away from bone, 2 to 3 hours. Remove from oven, tent loosely with foil, and let rest for 30 minutes. Heat oil in medium saucepan over medium heat until shimmering. Add onion and cook until softened, about 3 minutes. Stir in tomato paste and paprika and cook until paste begins to darken, abut 1 minute. Add ketchup, vinegar, sugar, Worcestershire, and celery salt and bring to boil. Reduce heat to medium low and simmer until slightly thickened, 8 to 10 minutes. Transfer to bowl and let cool to room temperature. Season with salt and pepper to taste. 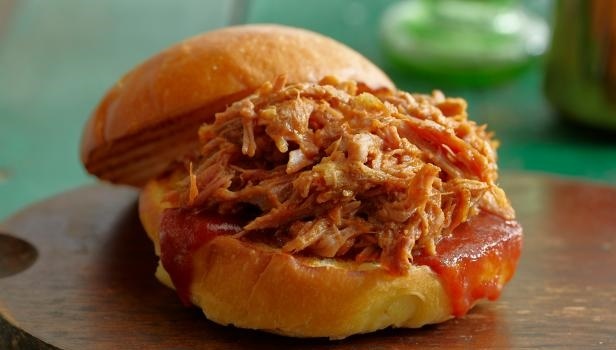 Serve with Oklahoma Barbecue Chopped Pork. Combine all ingredients in bowl, cover with plastic wrap and refrigerate until chilled, at least 30 minutes. Serve with Oklahoma Barbecue Chopped Pork. (Relish can be refrigerated for up to 5 days)End.